dispatches from Dan: Geography and geometry; programming techniques and languages; entrepreneurship and the life of a new company; environmentalism and rock climbing... and who knows what else? The time has come to introduce my weekends-and-evenings project for the last month to the world. World, meet Boundary Generator; Boundary Generator, meet world! It's an open source (GPL) geoprocessing tool. There are still some rough edges and the functionality is primitive, but it's good enough for people to download and give it a whirl. What it does: Given an input layer of polygons, it creates lines that represent the shared borders between those polygons, attributing it with the IDs of the polygons on each side. The output is an adjacency table, useful for all sorts of analyses. (For an example I'm familiar with, it is a required input to the MARXAN family of tools for automated conservation reserve design). For the programmers, it is a nice chunk of sample code for building a geoprocessing tool in C#. It is also an example of working directly with the underlying methods of computational geometry rather than relying on a pre-built API. Boundary Generator is extremely alpha, so expect bugs and use with caution. I have done some testing, but far from enough. You can run the tool and use the results however you like. You can copy and paste code from the tool, include it wholesale in a bigger project of yours, or modify it to fit your needs, so long as you never distribute the larger project to another entity (it will forever be internal-only), or you distribute your project under the GPL as well. If you'd like to include any code from this tool in a project of your own under other terms, you can contact me to discuss them. 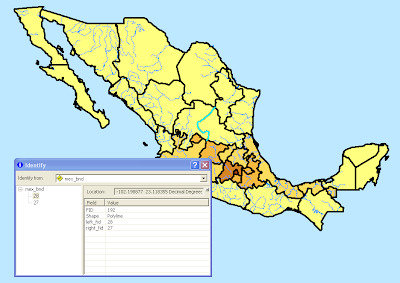 Altruistically, to give GIS practitioners a useful tool -- for free! -- and GIS developers a larger example of ArcObjects geoprocessing to examine. Less altruistically, my company will be releasing commercial products for GIS professionals in a fairly short timeframe; this is a great opportunity to attract potential beta users and measure the audience. And finally: I have some availability for low-commitment consulting on top of ongoing product development. If you are reading this, like what you see in Boundary Generator, and have a small-yet-interesting geospatial problem to solve, please contact me. I hope people find this interesting; I am planning on spending some more time cleaning up the rough edges over the next month or so. Feedback is extremely welcome! Kudos Dan! We need more ArcGIS Developers kicking code out into the public domain. One thing though - you may want to change the license to LGPL or MIT. GPL requires that anything that uses this code must also be released as open source. LGPL allows this library to be used in any sort of project, with only the changes to the library being forced into the open. The MIT license is a "do what you want, but don't call me if it all blows up on you" type of license - I find this is what gets people using the code. Glad you like the tool! I'm not entirely committed to the GPL, but at the moment it's one of the many experimental aspects on Boundary Maker. Your feedback is a nice data point for that, and at some point in the future I may well switch the licensing around. I am currently spending my days at my infant software company, producing software to ease the tediums of GIS work and to enable sophisticated geographical analysis. Everything that I write and post here is my personal opinion, and does not represent my company or my clients' views in any way.